The House of Black Bolt crumbles. 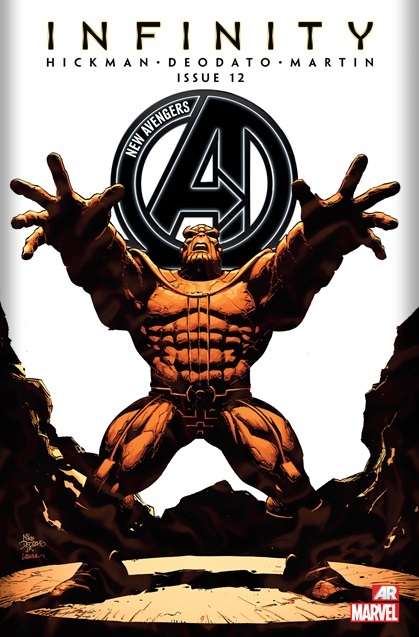 Cover– Thanos, frozen in perpetual un-death bathed in orange hues on a plain white background. Heartbreaking- This issue T’challa has to deal with the fallout from Infinity, his absence while the capitol was attacked and the defection of the Dora Milaje. Oh lord. My heart is heavy reading and reviewing this issue. T’challa, the deadliest man alive, king of the dead and leader of the new Illuminati has now paid the ultimate price for saving the world. He is a man without a home and without allies in that home. The Dora Milaje are loyal unto death to T’challa, a quick glance at Doomwar shows you just how deeply their loyalty runs. This issue they break away from their king, they oust him as an ally of Namor and allude to other secrets. His sister has no choice but to banish him from the capitol city. 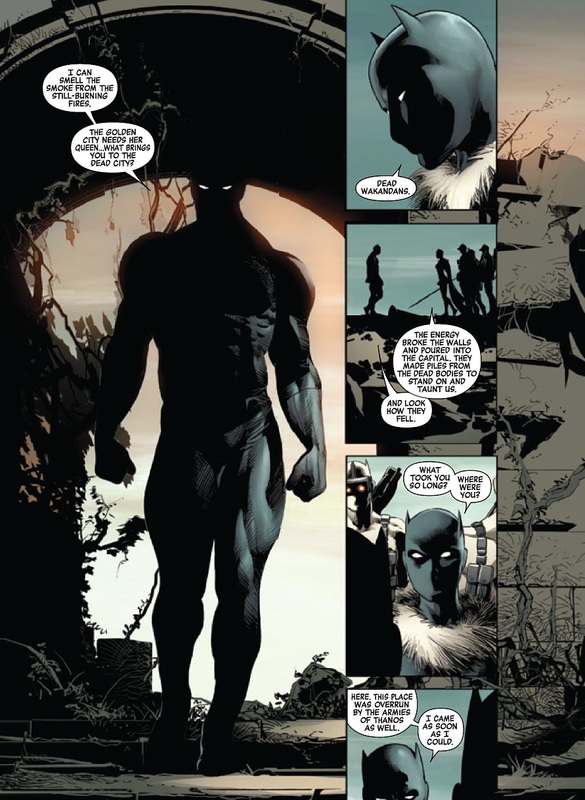 T’challa is now relegated to the Necropolis…the place Black Panther’s go to die. The Queen- Hickman’s depiction of Shuri hits all the right damn notes. She comes across as Regal, majestic and most of all commanding. She is what Wakanda needs on the throne right now and despite her brothers betrayal she does not try to exile him from Wakanda instead she simply forbids his entry into the city. Hopefully Hickman is aware of the bond between these siblings. Leading up to Doomwar together they forced Doom and his allies to expose themselves so they could deal with them accordingly. Shuriknows whatever it is that may have prevented T’challa from entering the fray is secret enough for him to not share in front of the Hatut Zeraze or the Dora Milaje but she trusts him nonetheless. 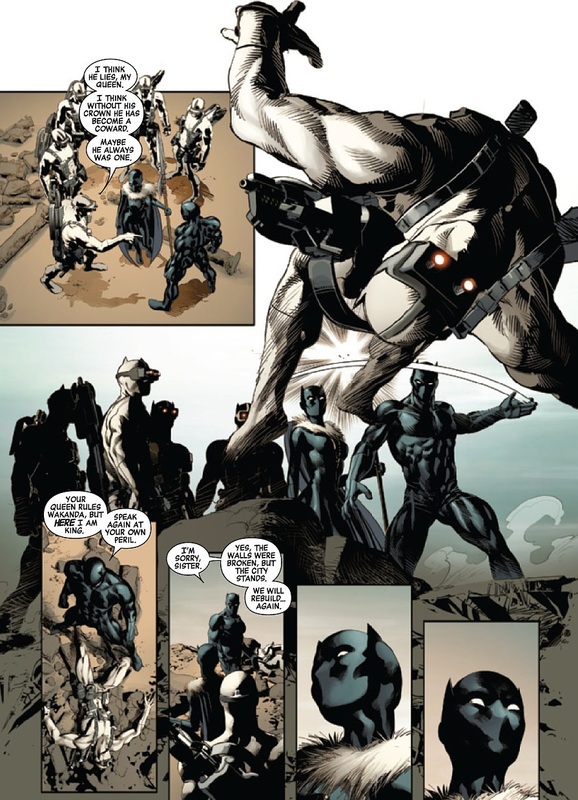 Wakanda– While some will lament Wakanda was once again attacked, Infinity showed something else. Wakanda is still standing! The Inhuman city of Atitlan has been destroyed, Atlantis home of Namor has also been destroyed but the great and proud Wakanda still stands, sure it needs to be rebuilt but it’s still here. Still a shining radiant city that has never been conquered! Hickman and me….what a bromance! Hatut Zeraze– I’m not shocked one of Hunter’s men would be the first to accuse T’challa of lying. He did exile the lot of them back in the day. Dr. Strange– Stephen is shaken by the events of Infinity and being used by Ebony Maw. He decides to use a forbidden book of magic in hopes of serving some purpose in the coming battles. This makes perfect sense since he spent Infinity as a pawn and caused the events of the Mighty Avengers 1-3 to occur. As powerful as he is, he became the biggest liability of the Illuminati. Black Bolt– The Inhuman king has lost the lions share of his abilities during the detonation of the Terrigen bomb. His brother suggests they keep it a secret but in light of Inhumanity and what Karnac said….this may have been Maximus’s plan all along. Create a monstrous kingdom and weaken the king in hopes of taking the throne. Dangerous bedfellows indeed! Revelations– Black Swan this issue explains that the Infinity event was paltry compared to what is coming. She reveals that the builders while powerful were not the most powerful beings out there. The Ivory kings, the mapmakers etc, threats that dwarf the builders. She tells the Illuminati to prepare themselves because everything will die. This was a spine tingling exchange that ties into Hickman’s earlier issues on both Avengers 2013 and New Avengers 2013. Check those early issues and you start to see the jigsaw puzzle coming into view. Art- As always with this title, it was simply divine. I did not like this one at all. .T’Challa is cast out . And he numbly accepts it like a steer at the slaughterhouse. And life is a burden. I can not see my way to spending $ 3.99 of my hard earned minimum wage dollars on a comics in which every one is unhappy and just leaves me feeling bad. There was an echo of how casually Storm was cast out in my mind as well………what goes around comes around perhaps? Knowing T’challa he’ll just brood on and worry about saving the world. He’s always been very distant emotionally. The “powers-that- be ” at marvel really missed a lot of opportunities to make use of the characters and their relationship and bring us engaging stories that were insightful and thoughtful as well as entertaining. I was never sure this was because they did not want to or simply could not ( a lack of ability)or were afraid to try.